For years the Big Ten was referred to as the Big Two, Little Eight. Then Penn State joined the conference and, depending on the season, the name either added a “Medium One” or altered the ending to “Little Nine.” That seems like eons ago. While Ohio State has still dominated the conference in recent memory – the Buckeyes had won at least a share of six-straight Big Ten titles before last season’s swoon – Michigan hasn’t been a continually dominant team since the late 90s. That, coupled with the league’s parity since the mid-90s and the Big Two, Little Eight is so stuck in the Bo Schembechler-Woody Hayes Era. 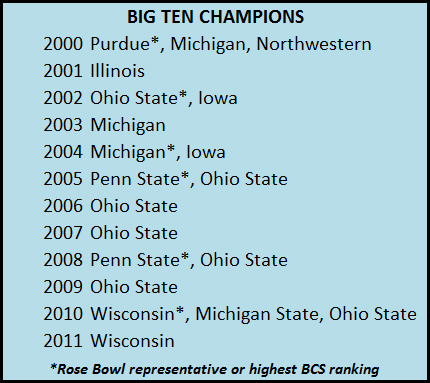 Since 2000, nine of the current 12 Big Ten teams have won at least a share of the Big Ten Championship. (That, of course, is counting Nebraska as one of the teams that have failed to win a conference crown despite just one season in the conference). See the chart below for the conference’s champions in the last dozen years. ***The oddsmakers are pretty clear about their expectations in the Big Ten: Michigan, Nebraska and Michigan State will battle for the Legends Division crown while Wisconsin is practically guaranteed to win the Leaders Division title. Interestingly enough, it’s Michigan – not Wisconsin – that is the league favorite. I think the Wolverines have the ultimate playmaker in Denard Robinson who can steal them a game or two as well as a defensive unit that plays like one of the nation’s best. However, what makes Michigan so dangerous also makes it scary in a negative way. Put nicely, if Denard could throw the ball like Tim Tebow Michigan would be a national championship contender. Nevertheless, Denard throws jump ball after jump ball as if he’s officiating NBA games. Nevertheless, if Denard trashes the turnover bug, this team could be very dangerous. While it “technically” has no impact on the Big Ten schedule, Michigan’s opening game vs. Alabama in Dallas and battle at Notre Dame in the nonconference will really set the tone for the season. Michigan gets Michigan State at home but does travel to Nebraska’s Memorial Stadium. Those back-to-back games, at worst, need to be split. If Michigan loses them both, which is a very real possibility, the Big Ten title is all but a dream. The conference finale at Ohio State could also have conference title implication. 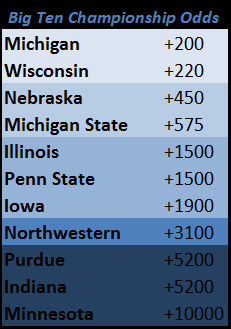 Avoiding Wisconsin and Penn State might be the reason Michigan is getting the most Big Ten love, but at +200 I would avoid the Wolverines like the plague. Last year’s team overachieved and this year’s team is facing higher expectations. There is nowhere to go but down and this could easily be a 9-3 or 8-4 season with 2-3 conference defeats. ***One reason to like Wisconsin at +220 is this simple fact: The next “best” teams in the Leaders Division are Illinois and Penn State (both at +1500). I’ll have more on those teams later but Wisconsin is such a huge favorite to win its division that, if you assume it’ll indeed happen, you have a 50/50 shot at Wisconsin winning the Big Ten title, which is much better than the 8.33 percent chance each team technically has to win the title in the preseason. (For 2012, the percentage is actually 9.09 due to Ohio State’s ineligibility). Breaking in a new quarterback for the second straight season won’t be easy despite Russell Wilson making it look easy last season. Of course, Wisconsin’s schedule couldn’t appear much easier: Michigan State and Ohio State both visit Camp Randall while rebuilding Penn State is arguably the second-toughest conference road game. The Big Ten opener at Nebraska might play an outside role at Wisconsin’s Big Ten title game spot but it would be a complete shock (almost as shocking if Minnesota won the Legends Division) if Wisconsin didn’t represent the Leaders Division in the title game. That alone is a reason to seriously consider Wisconsin at +220. ***The worst odds in the Big Ten go to… Nebraska. The Cornhuskers travel to Ohio State, Michigan State, Iowa and Northwestern. Memorial Stadium plays host to Wisconsin, Michigan and Penn State. Outside of the bye week and Minnesota there are no guarantee victories on that slate. With that schedule compared to that of Michigan and Michigan State – Nebraska’s other Legends Division title foes – the Cornhuskers might have to go 6-1 to claim a spot at Lucas Oil Stadium for the conference championship game. Heck, going 6-1 in that stretch might have Nebraska in the national championship hunt. The schedule and another year of getting accustomed to the Big Ten will likely have Nebraska on the fringe of the Top 25 but nowhere near a Rose Bowl berth. At +450 there are much better plays than Nebraska. ***One of my favorite plays here is Michigan State. At +575, the Spartans are a great mix of risk and reward. Losing Kirk Cousins – the winningest QB in team history – will hurt but Andrew Maxwell is more than capable of filling those shoes. (Cousins, for what it’s worth, had to fill the shoes of Brian Hoyer… who had to fill the shoes of Drew Stanton, who had to fill… you get the point). The Spartans get Ohio State, Iowa and Nebraska at home this season which is a major plus. The make-or-break point of the season will be the final two weekends in October; Back-to-back road trips to Michigan and Wisconsin will determine the division crown. With a four-game winning streak against Michigan, 3-0 against Denard, the Spartans could actually be favored in that game. The roadie at Wisconsin should be another classic. If Michigan State can somehow win both of those games it might assure itself of a second straight trip to Lucas Oil Stadium. In taking MSU’s 23/4 odds you’re banking on the Spartans splitting the Michigan and Wisconsin games and not faltering elsewhere. It’s not a bad gamble given MSU’s recent history. ***My favorite sleeper play is Iowa at +1900. Put it this way, I’m always a big fan of looking at solid teams who aren’t favored to win their divisions. The reason: It’s always a good play. While Michigan, Nebraska and Michigan State are projected to finish 1-2-3 in the Legends Division, don’t count out the Hawkeyes who have are always good for a 10-win season when the country least expects it. I think Iowa can be a major surprise in the country this year. The schedule sets up very nicely, especially if Iowa can upset Michigan State in East Lansing. A 5-0 start is almost guaranteed. While Penn State will be tricky, playing at Kinnick Stadium is enough for me to give Iowa the edge. Win that game and it would be very conceivable to see Iowa at 10-0 heading into the final two conference games: at Michigan and home against Nebraska. Again, this pick would all hinge on an upset at Spartan Stadium to get the ball rolling, but don’t say I didn’t warn you of this major sleeper. ***One trend you’ll notice the more you read my stuff is that I love a team projected to finish a distant second in a division. Enter Penn State. (Illinois has the same odds but let’s pretend that isn’t the case for this argument). While Wisconsin should win the Leaders Division going away, what if injuries pile up and Wisconsin staggers to an 8-4 season with 3 Big Ten losses? Well, what happens is another team likely represents the Leaders Division in Indianapolis. If I’m to gamble on another team, it’s the Nittany Lions. The defense never changes and that’s a good thing. Penn State avoids Michigan and Michigan State and gets Ohio State and Wisconsin at home. This isn’t to say playing at home makes those two victories, but it surely upgrades the chances. The two road toughies are the aforementioned game at Iowa’s Kinnick Stadium and at Nebraska’s Memorial Stadium. Nevertheless, Penn State could surprise, making +1500 a nice play if you’re not sold on the other Big Ten favorites. While I enjoy taking teams with long odds the Big Ten’s bottom four teams will just steal your money. You could give me +1000000 odds on Minnesota and I wouldn’t touch it. The same goes for Indiana, Purdue and Northwestern. While I could see all teams fighting for bowl berths, a Big Ten Championship is nothing more than a pipe dream for these teams. Bottom line: I think the Big Ten will have one of the more interesting conference races this season. I’ve vacillated on my pick for weeks and really haven’t settled on one team. My best advice is this: Wisconsin has the best chance to win the conference based on its weaker division and schedule. With four teams having a legitimate shot at coming out of the Legends Division which makes it tough to single out a team. (We’re not talking Alabama-LSU here where one game likely decides the division champ). 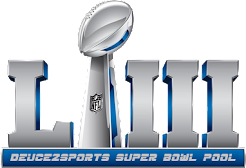 I could see dozens of scenarios where Michigan State, Michigan, Nebraska and Iowa all represent the Legends Division in Indianapolis. Because of that it is very tough to put cash on any of those teams. Forced to choose, I’d look at two: Michigan State and Iowa. No team has been more consistent in the last few years than the Spartans, who are coming off back-to-back 11-win seasons. Iowa, on the other hand, has the schedule that could make for a beautiful BCS run. That means I’m completely against the apparent favorite Michigan here. That would be correct. I find last year’s 11-2 season to be more of a fluke than the norm. If you’re in love with the Wolverines then by all means put your money where your heart is. Call me a major skeptic but here’s my biggest bold prediction: Michigan will be one of the season’s biggest disappointments. With that in mind, I refuse to touch the Wolverines. ***Much like the 2011-12 season, the odds tell an easy story: The winner of the regular-season meeting between Alabama and LSU has the inside track to the SEC title. (Notice I said nothing about the loser being eliminated from national championship consideration, sincerely last year’s Crimson Tide). LSU lost some blue chippers on defense but the unit continues to reload under Les Miles. The Tigers might be the best team in the country and only one road game is truly scary (at Arkansas in SEC finale). Nevertheless, playing at Auburn’s Jordan-Hare Stadium in the conference opener and at Florida and at Texas A&M in October won’t be cakewalks either. The biggest question I need answered before I put my faith behind LSU is will the offense be dependable. Take out both games against Alabama and LSU scored 35+ points in 11 of the 12 games (the only other offensive struggle coming in a 19-6 win at Mississippi State). In two games against Alabama the Tigers scored a combined nine points. Now, Alabama’s defense was one of a kind, but LSU was also one win away from being crowned one of the best college football teams ever. To win the SEC LSU is going to have to duplicate the year it had last season and that will be tough to do. ***Alabama, to me, is still the conference’s team to beat. Therefore I like the slightly better odds here compared to LSU (though I’m someone who would really value the extra $10 winnings on a $100 wager). The best thing about Alabama’s team is you’ll get a feel if it is SEC title material early. The season kicks off with a cross-conference battle against Michigan at Cowboys Stadium. Alabama has fluctuated between a 10.5- and 15-point favorite. It depends on how you feel about Michigan (our Big Ten odds will be revealed next week but the Wolverines are the Big Ten favorites), but I said in February that Alabama should be about a 14- to 17-point favorite and shouldn’t shock anyone with a three-touchdown victory. Of course, the Michigan game means nothing to the SEC Championship odds. The same day LSU opens at Auburn, Alabama opens at Arkansas. If Alabama happens to drill both Michigan and Arkansas, it’ll be carrying a lot of momentum through the SEC heading into the Nov. 3 showdown at LSU’s Tiger Stadium. Until LSU proves it can score a few touchdowns against Alabama’s defense, I favor Alabama regardless of the field. Like LSU, Alabama lost some key defensive components but I trust Nick Saban as a coach more than Les Miles. If you’re deciding between LSU and Alabama for your wager, side with the Tide in 2012. ***I really like Georgia’s 5-1 odds and here’s why: Whichever team wins the SEC East technically has a 50/50 shot at the SEC Championship. While Alabama or LSU would be heavy favorites, stranger things have happened in conference title games. Georgia played great for 30 minutes in the SEC title game last season before LSU carved up the Bulldogs in the final 30 minutes. Mark Richt’s team will be good and, probably lucky for the Bulldogs, will be flying under the radar all season because of the Alabama and LSU hype. Georgia’s schedule also positions itself nicely for a possible undefeated season: No Alabama. No LSU. Fairly-easy nonconference schedule. Surviving at South Carolina in early October is the season’s biggest test. Like the SEC West’s Alabama-LSU showdown, the SEC East is likely to be decided by the winner of the Georgia-South Carolina clash. Williams-Brice Stadium will be rocking but Georgia will be more than ready to win that and position itself nicely opposite of the SEC West Champion in the SEC title game. ***Arkansas’ 7-1 odds aren’t bad but I can’t see a situation where Arkansas beats both Alabama and LSU despite both games being at home. Even if it splits and there is a three-way tie atop the SEC West, I’m not confident Arkansas would win the tiebreaker. All that mystery coupled with the latest controversy in Fayetteville has me steering clear of anything Arkansas related. (Note: I attended Michigan State while John L. Smith was our head coach. If circuses win conference championships you should go all-in; unfortunately, that isn’t how things work and Arkansas will find that out quickly). ***South Carolina’s 21-2 odds might be my favorite because of the payout. It’s definitely a gamble for one reason: The Gamecocks have a three-game stretch of Georgia, at LSU and at Florida. That doesn’t include the SEC finale against Arkansas. I could see a real scenario where South Carolina finishes 11-1 but misses out on the SEC title game because of a head-to-head loss to Georgia. However, if you can imagine South Carolina winning all its home games, and the only loss coming at LSU, you would have the right mindset to think South Carolina could get its revenge in the SEC title game. ***The only other odds that peak my interest are Vanderbilt’s at 55-1. Like all long shots you have to have an abundance of faith, and here is why Vanderbilt could surprise: The schedule avoids Alabama, Arkansas and LSU. The first two conference games will either set the stage for a magical SEC Championship run or another .500 season. If Vanderbilt can upset South Carolina at home in the season opener it only has to get past Georgia at Sanford Stadium to have the inside track on the SEC East championship. Would it be a shock if Vanderbilt beat both Georgia and South Carolina? Absolutely. Would it be apocalyptic if Vanderbilt somehow upset LSU or Alabama in the SEC Championship game? Undoubtedly. Could it happen? At 55-1 it’s worth a gamble. Bottom line: It would be very surprising if the coach holding the SEC Championship trophy in December wasn’t Les Miles or Nick Saban. It’s tough to peg a winner in the showdown this far out as well. The smart strategy would be to make a play on an underdog (Georgia, South Carolina or Vanderbilt) now and, as the season rolls on, pick your favorite between LSU and Alabama in early-to-mid October. Though, I don’t think I’ve ever been more of a Vanderbilt fan until now. The Commodores have never won the SEC Championship. Maybe the Mayans really want the world to end with a bang.